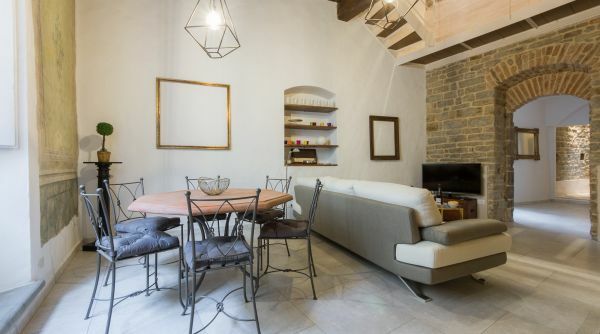 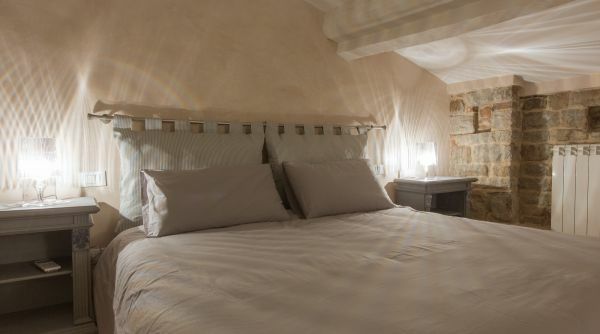 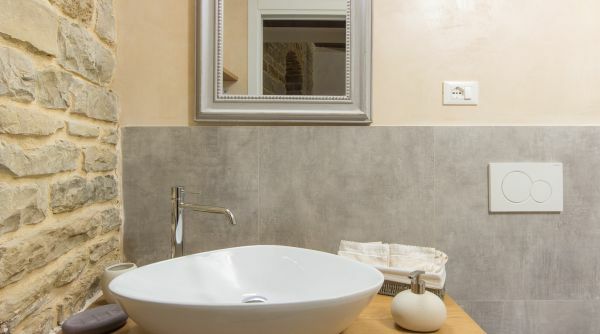 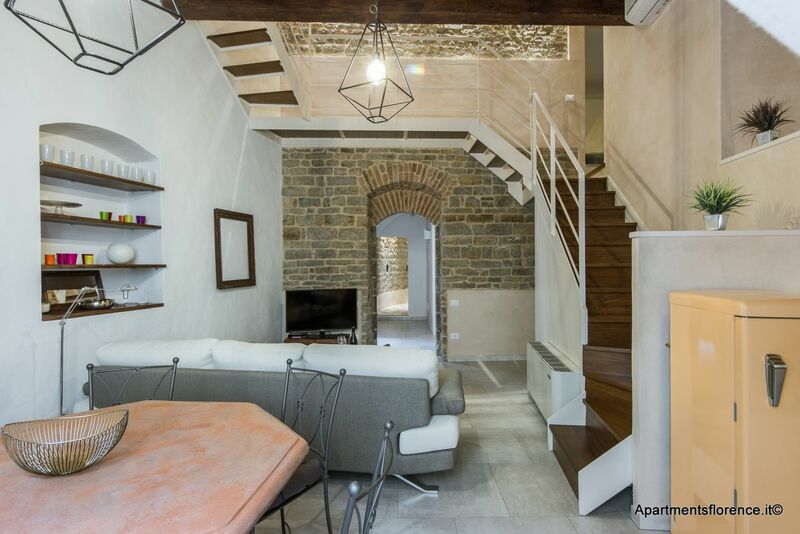 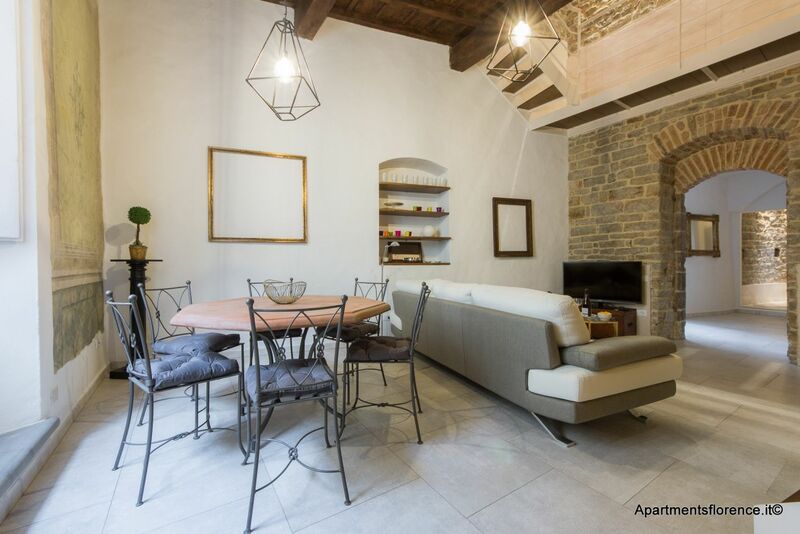 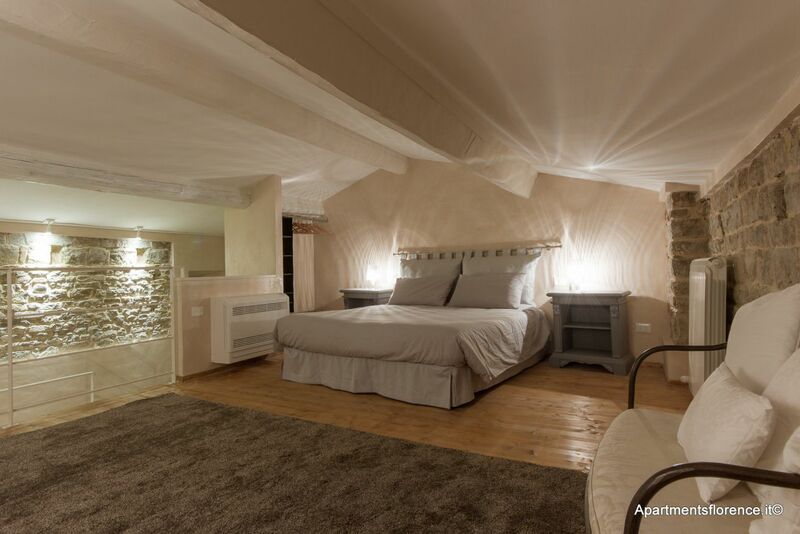 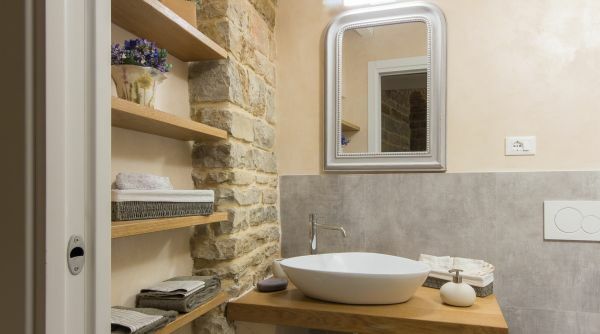 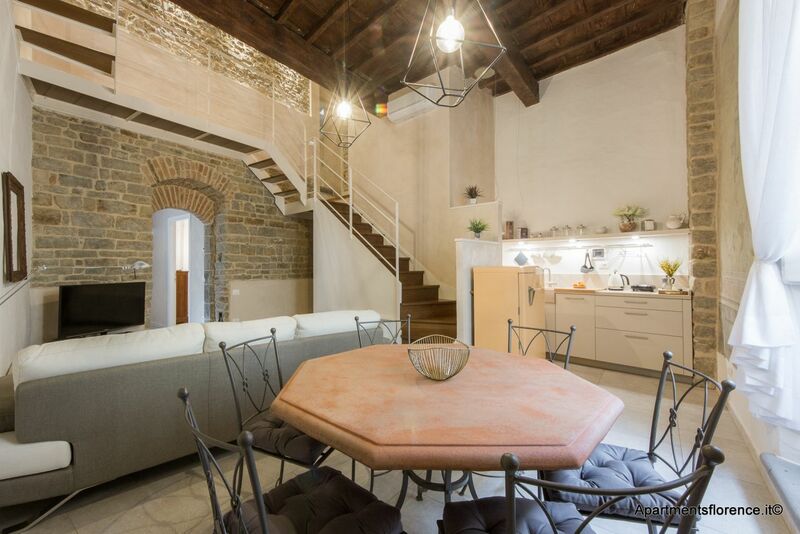 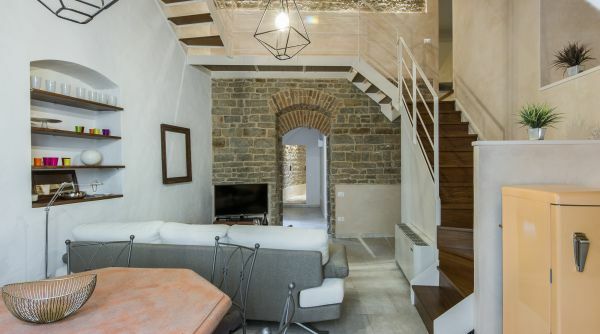 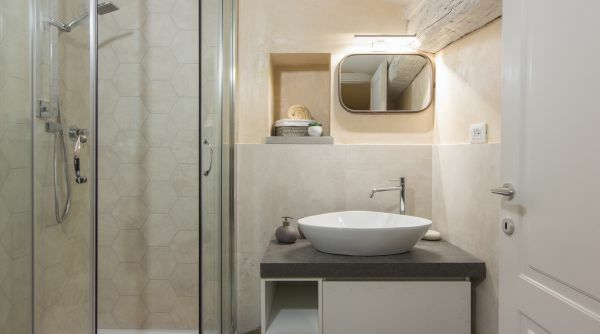 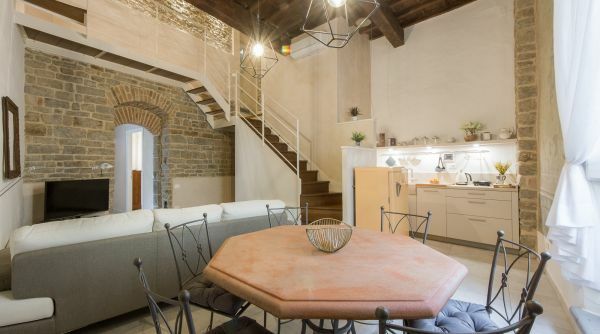 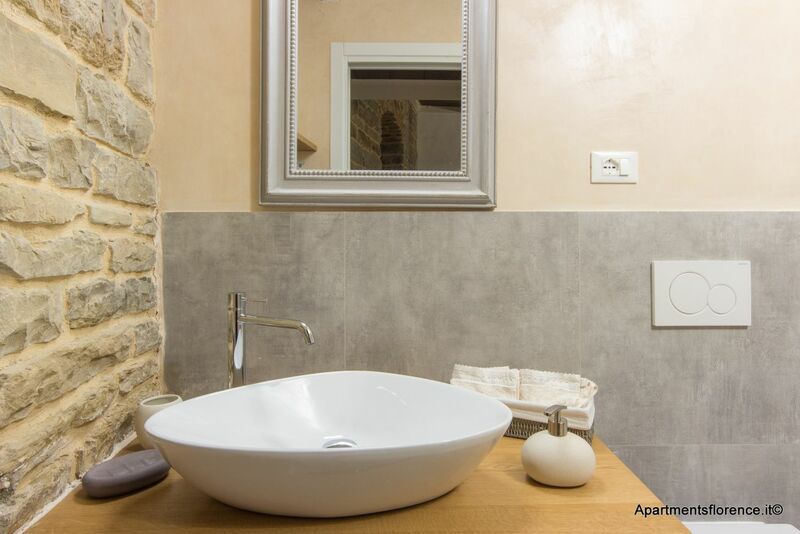 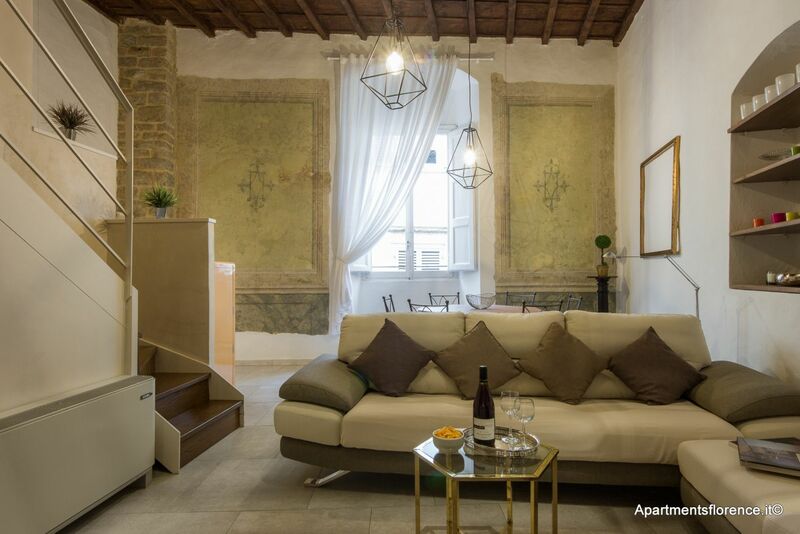 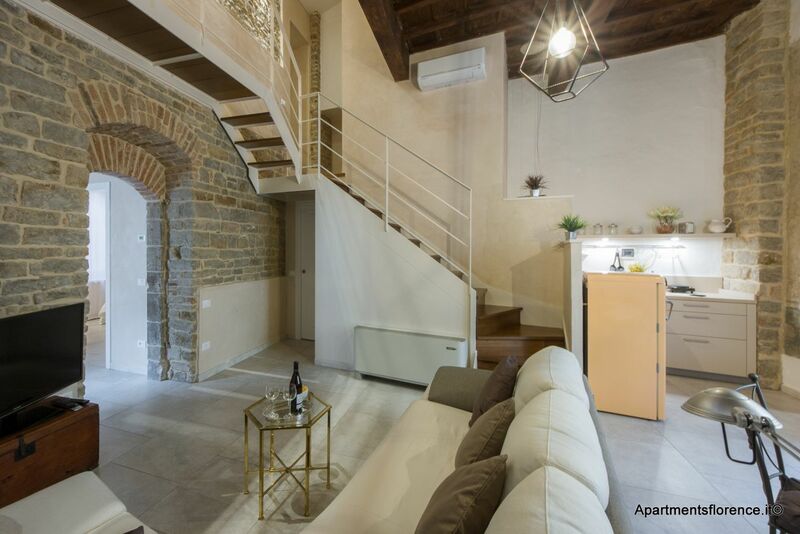 A recently renovated 3-bedroom, 2-bathroom loft apartment in the center of Florence that combines traditional Tuscan character and contemporary style, creating a magical experience for any guest. 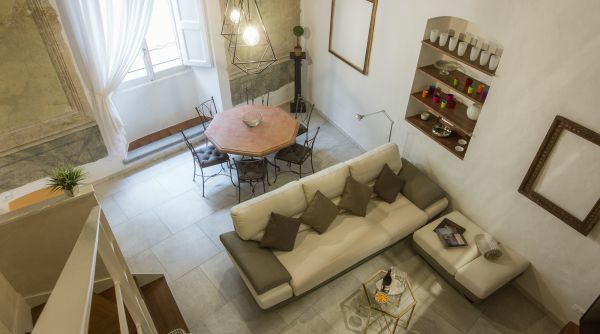 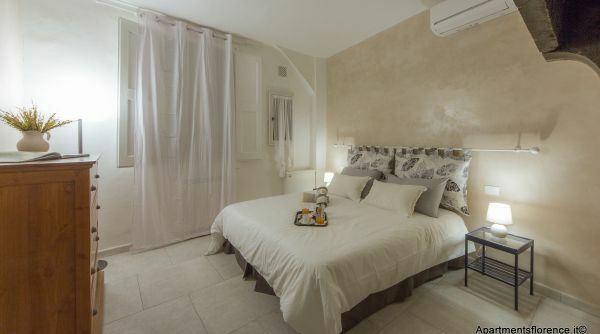 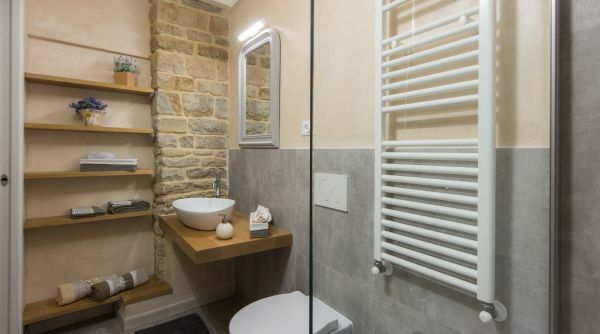 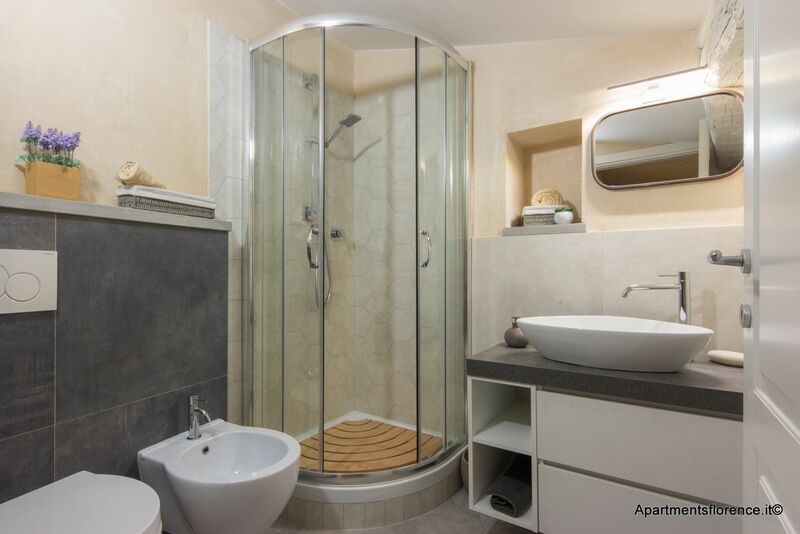 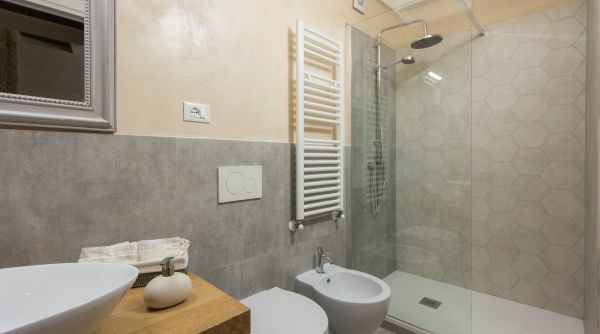 The apartment is located in the heart of Florence on Via della Burella – right in front of Piazza Santa Croce, a 5 minute walk to the Duomo and close to all the main sightseeing and cultural spots that our city has to offer. 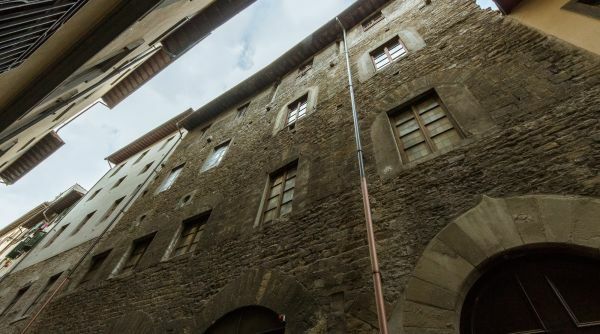 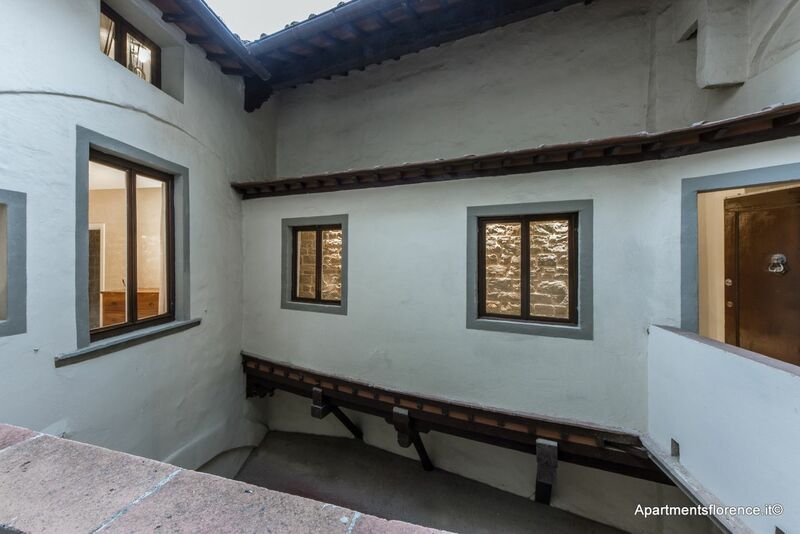 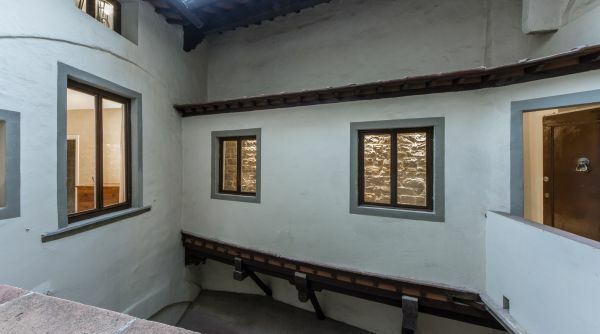 This property is around the corner from one of Florence’s most famous and beautiful museums, The National Museum Bargello, where works of Donatello and Michelangelo can be found. 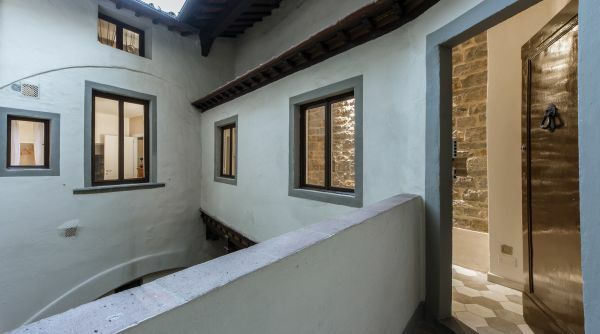 On a more savory note, right downstairs you will find one of the oldest and most historical gelaterias in Florence – Gelateria Vivoli, where you can enjoy the original and delicious Italian gelato. 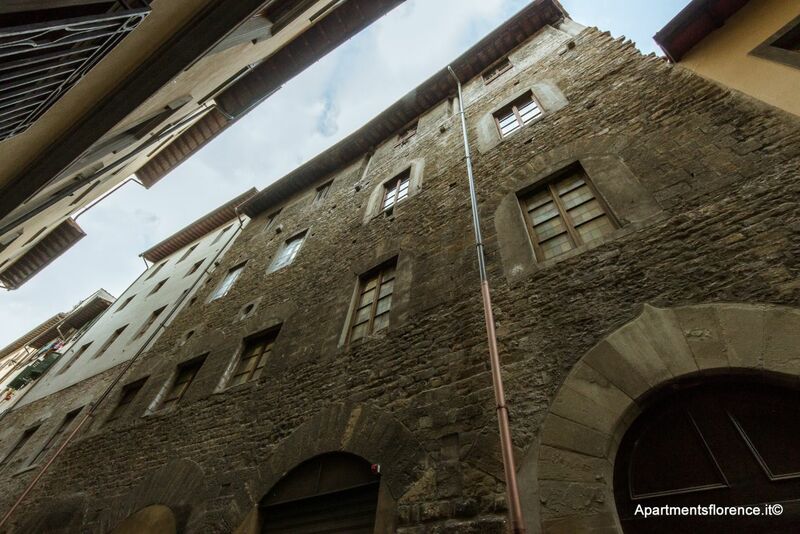 The apartment is located on the 2 floor (3rd up) with fairly easy stairs. 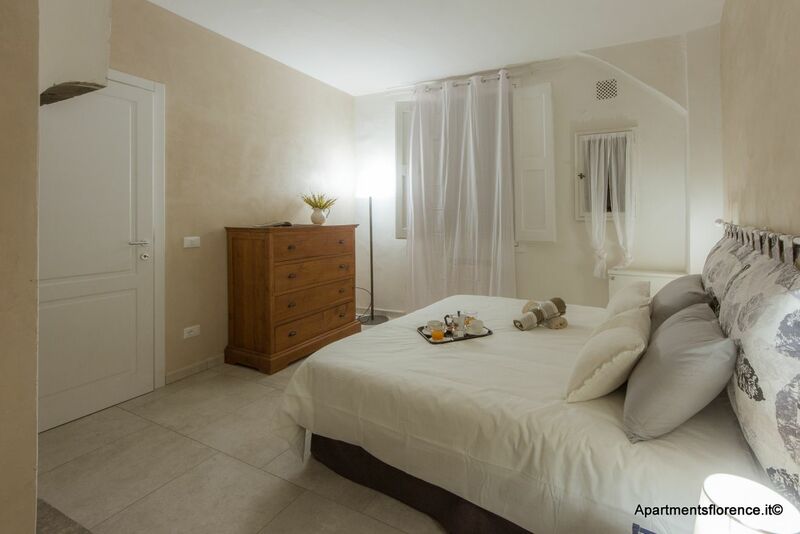 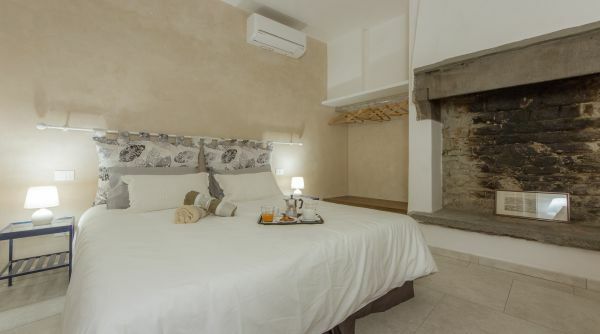 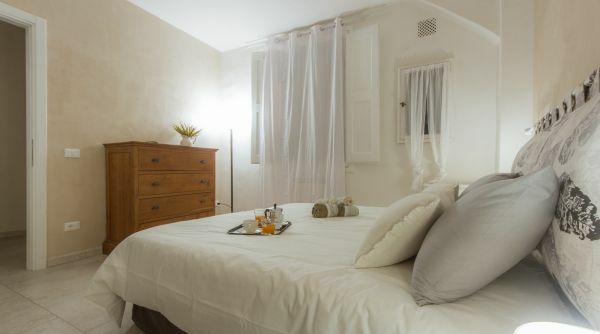 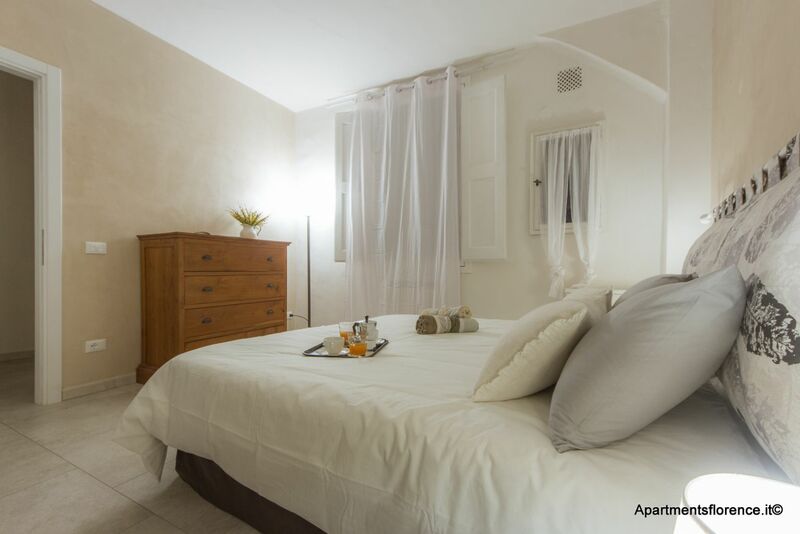 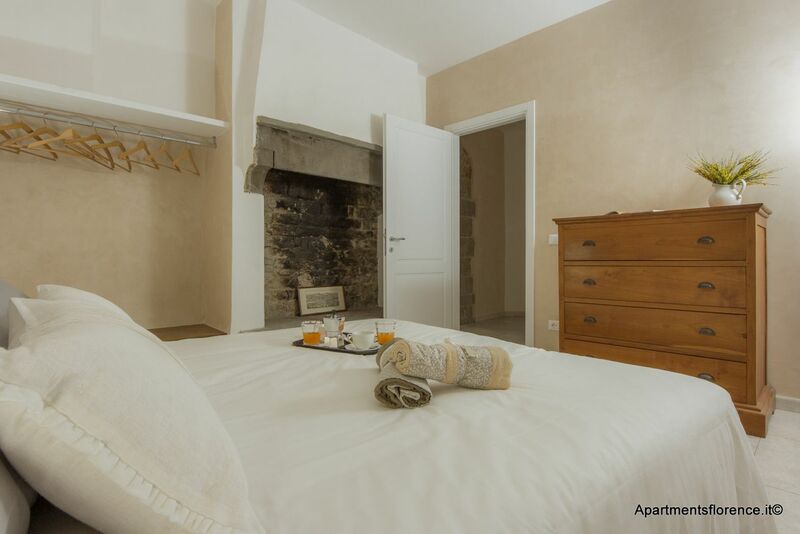 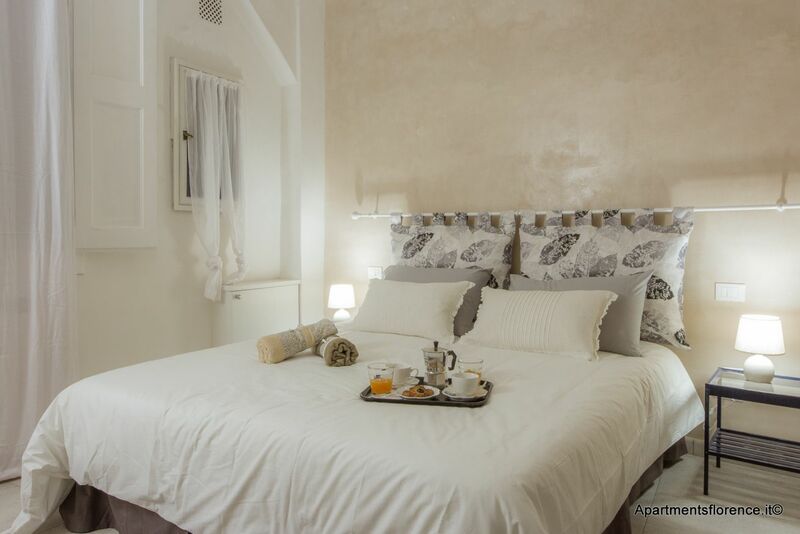 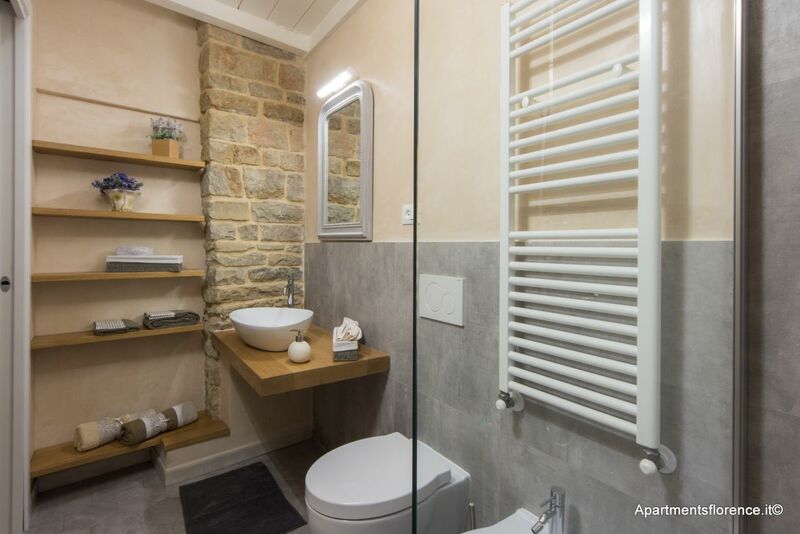 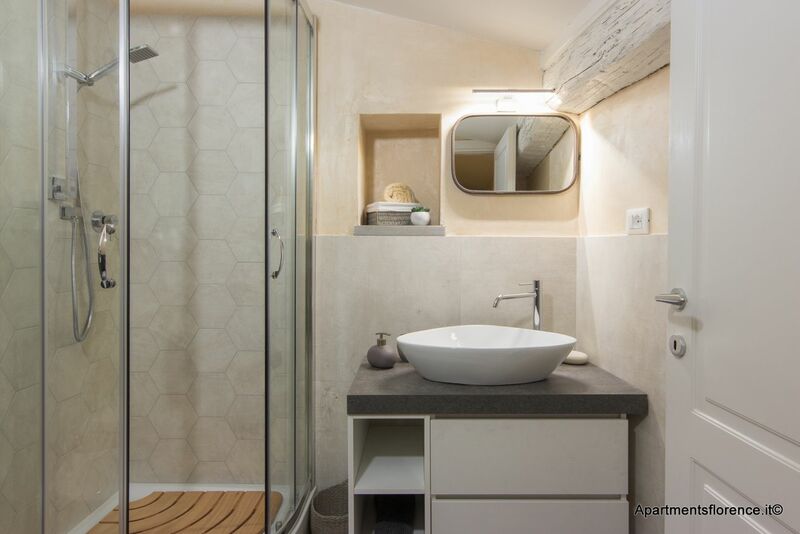 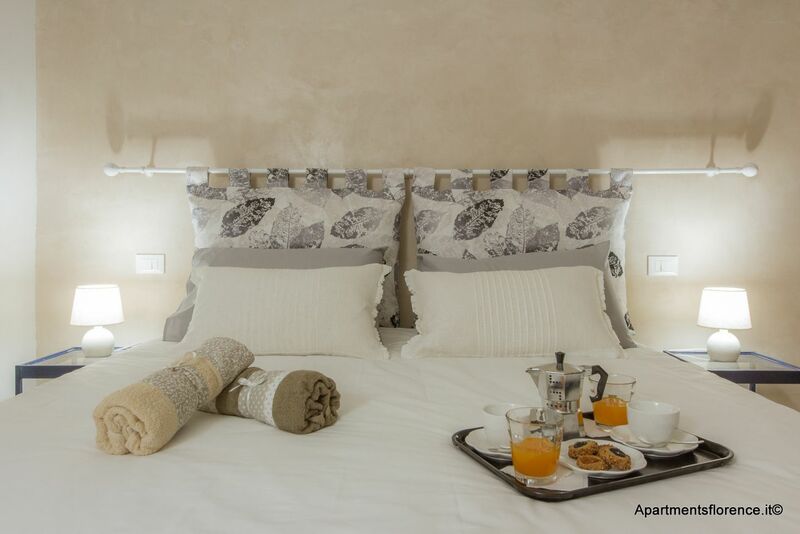 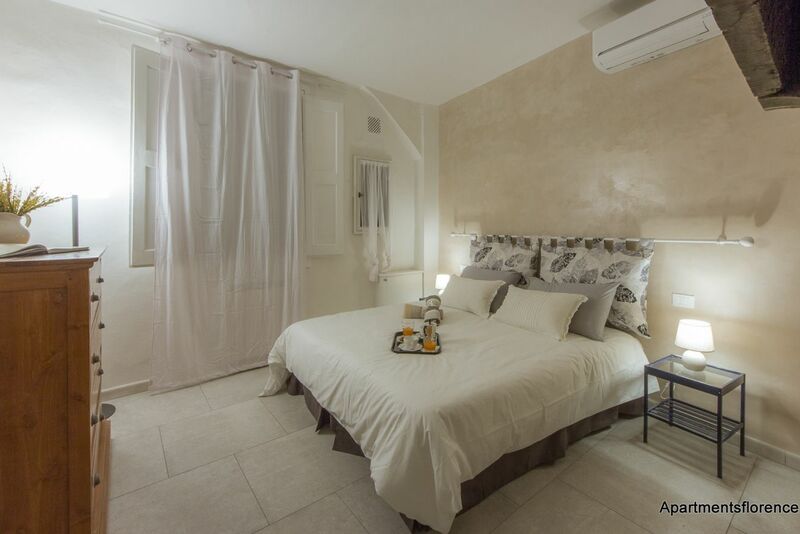 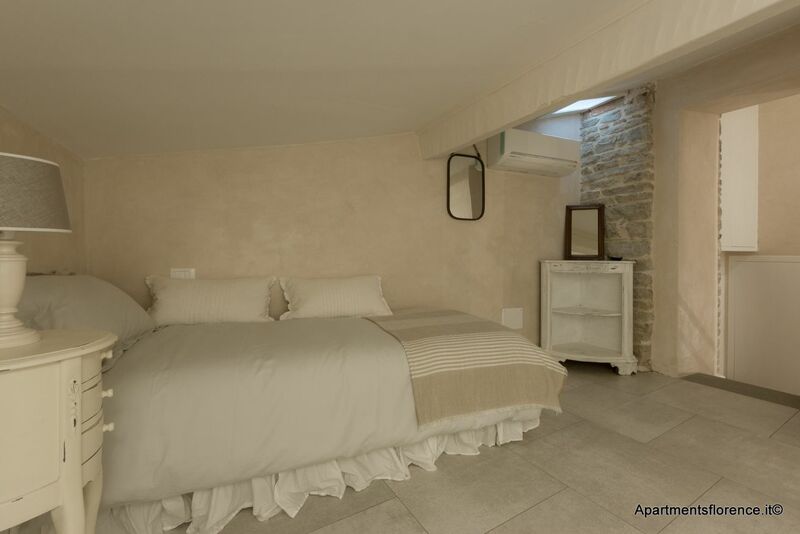 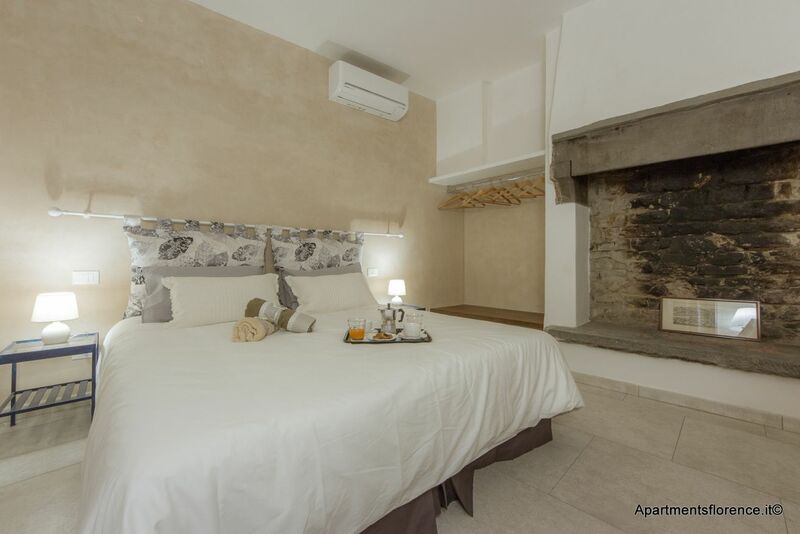 The apartment has been recently renovated, with refined touches and elegant style, combining the old and the new in a unique way. 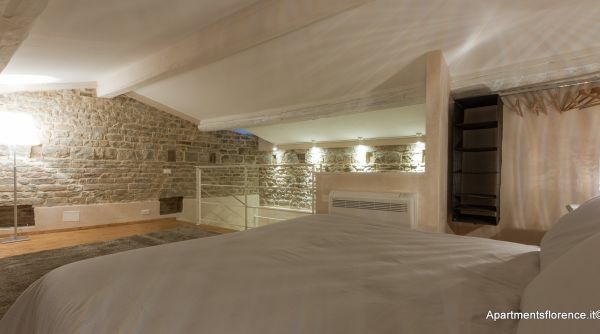 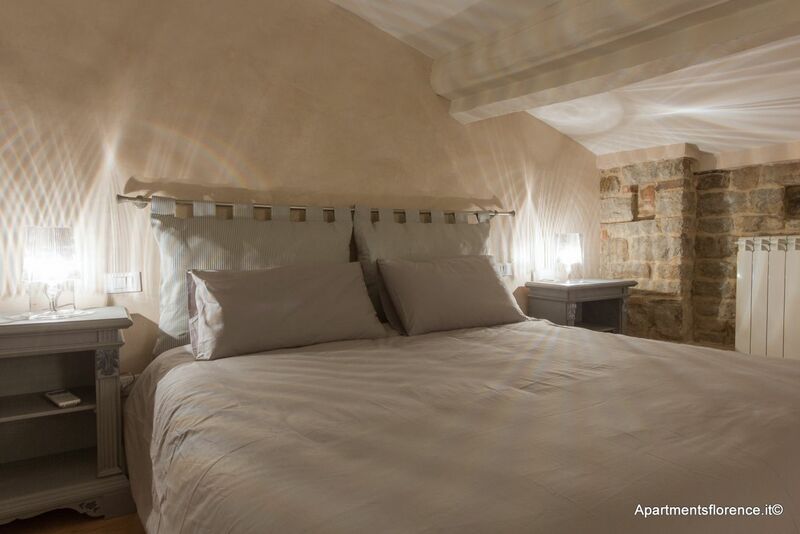 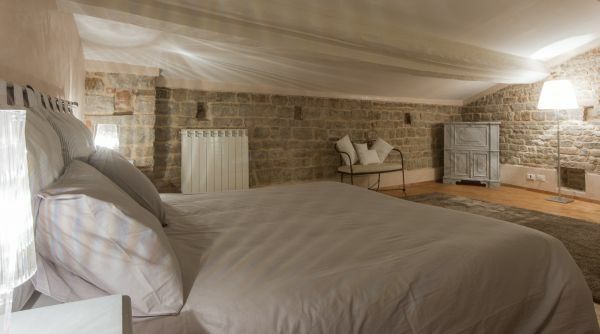 As you walk in, you will find yourself in the corridor where you can see the original stone wall of the old palazzo. 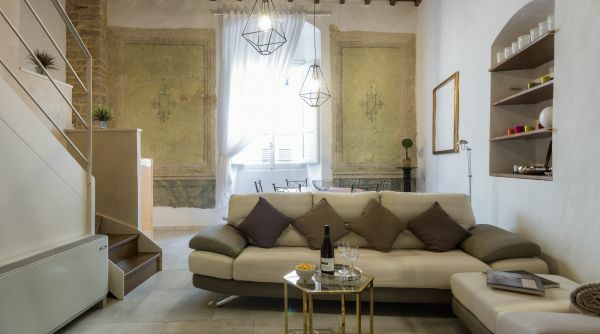 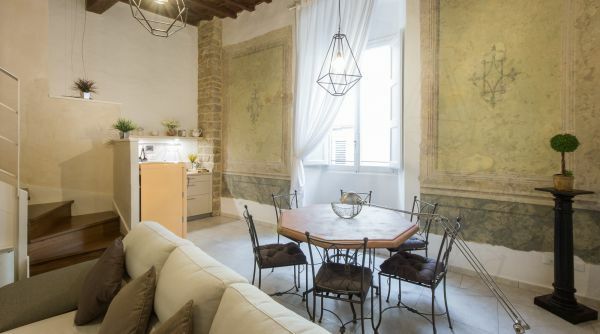 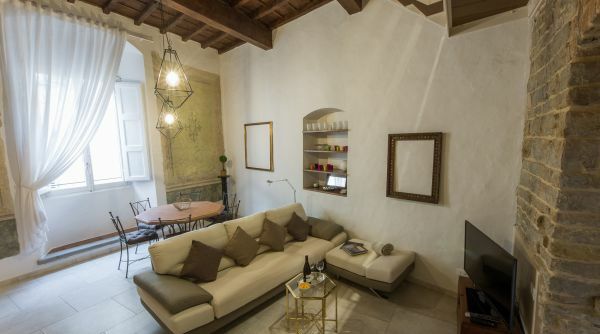 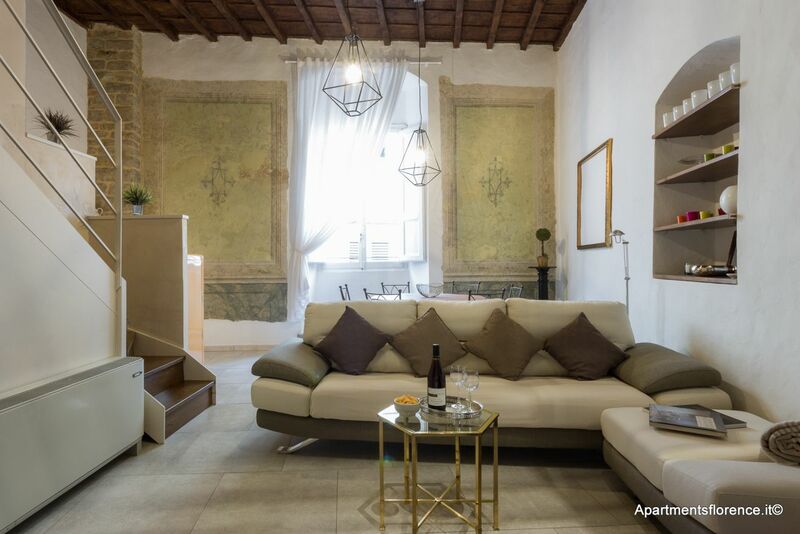 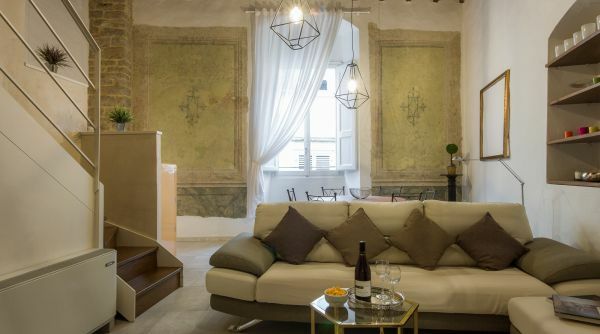 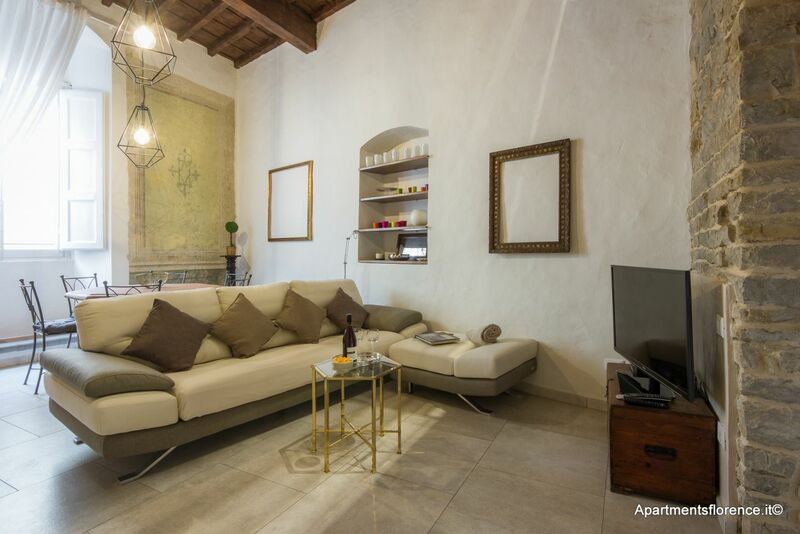 This particular Florentine characteristic, together with the original wooden beams and the frescoes on the walls throughout the apartment really make you feel as if you have travelled back in time. 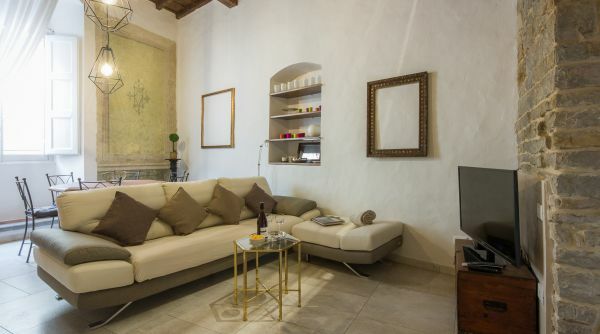 The living room is very spacious, containing a large couch with a TV in front, and a dining room table for six. 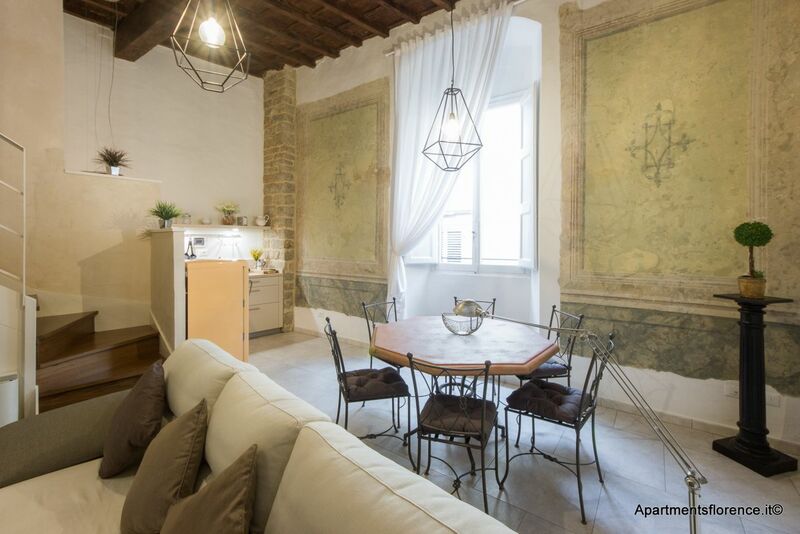 Original frescoes decorate the main wall of the living room, and the very tall ceilings add to the feeling of airiness and spaciousness. 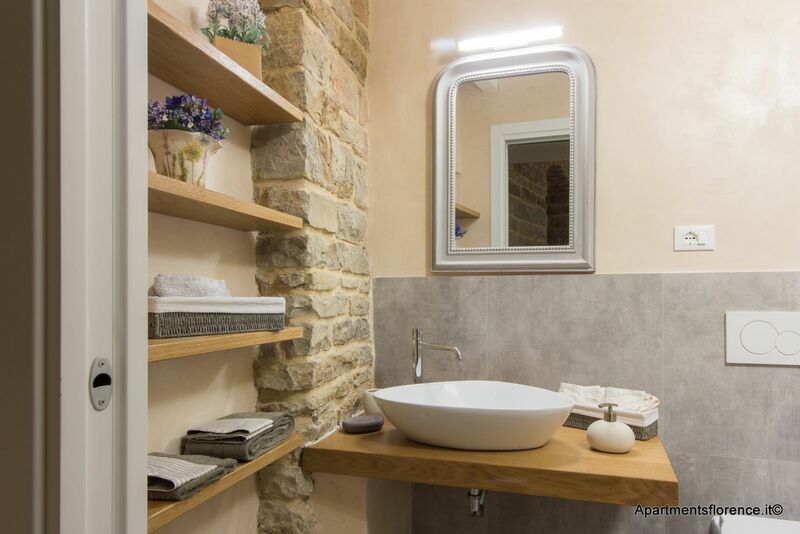 There are also contemporary touches, like the lights and frames that add to the consistent contrasting style of the apartment. 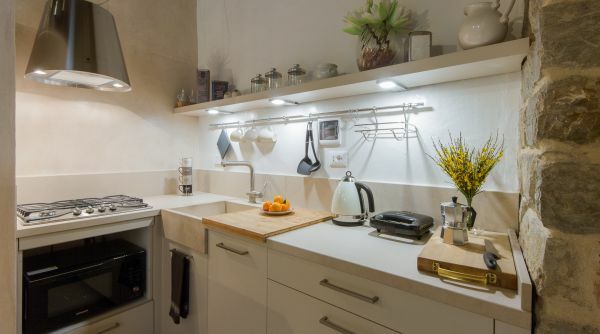 The kitchen is next to the living room space and despite its modest size in comparison with the apartment, is fully equipped with the amenities and comforts of a real home. 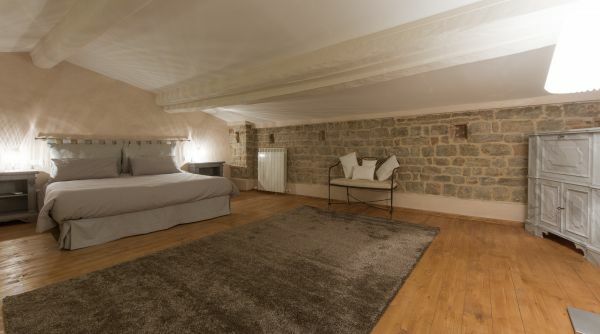 The first double bedroom is on the main floor and has an old original fireplace. 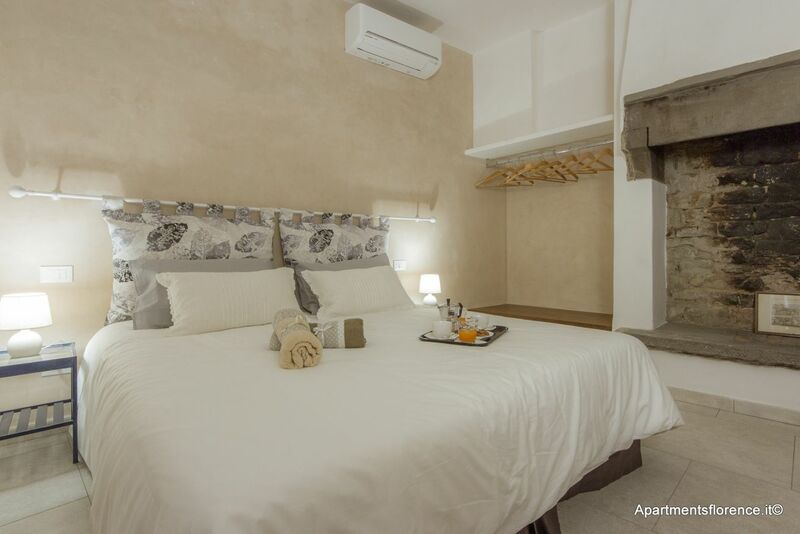 As you go up the stairs, you will find the single bedroom, which is a cozy and tranquil space with lots of storage capacity. 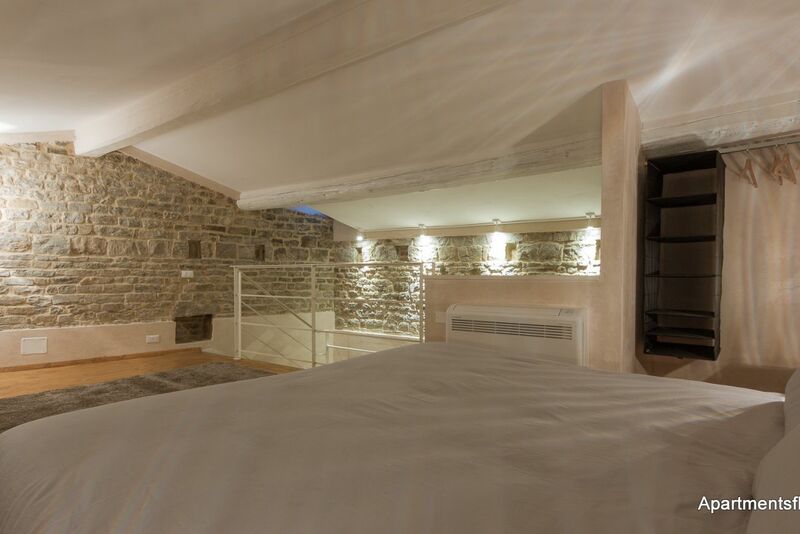 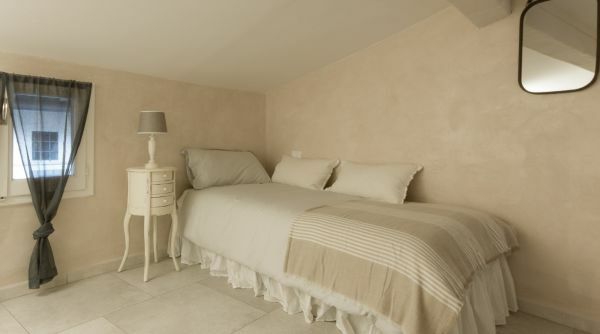 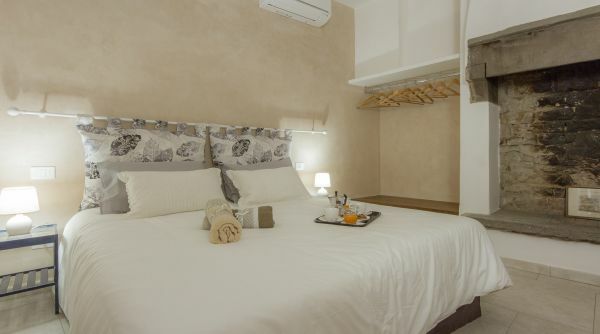 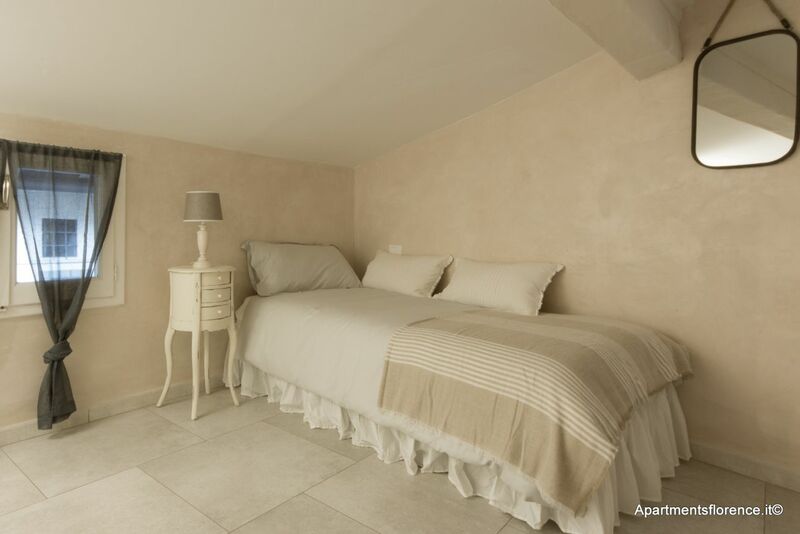 The second double bedroom is located at the top of the stairs offering privacy in a open space. 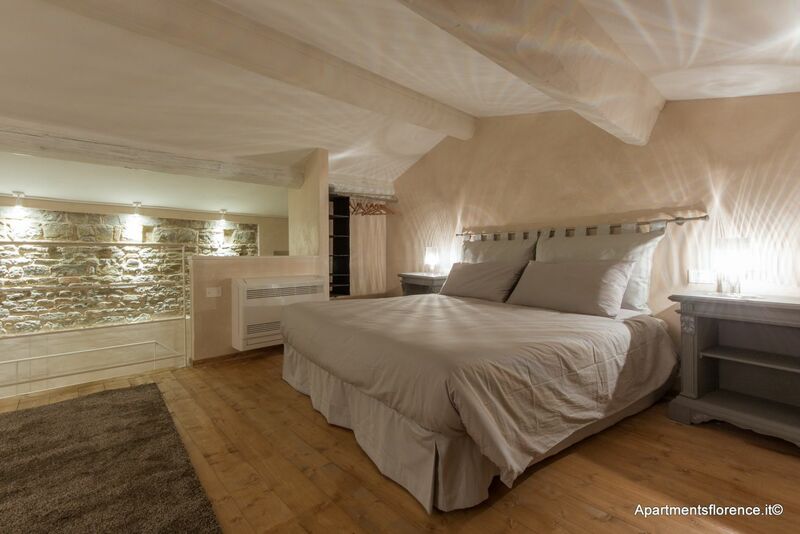 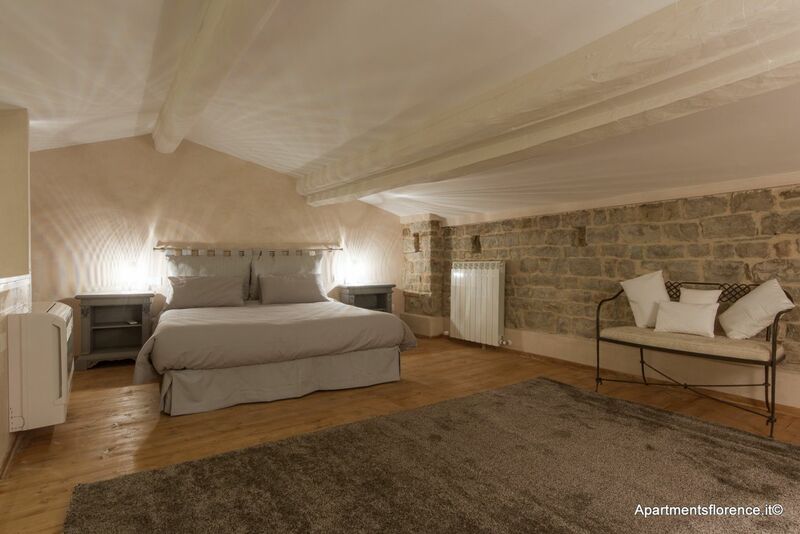 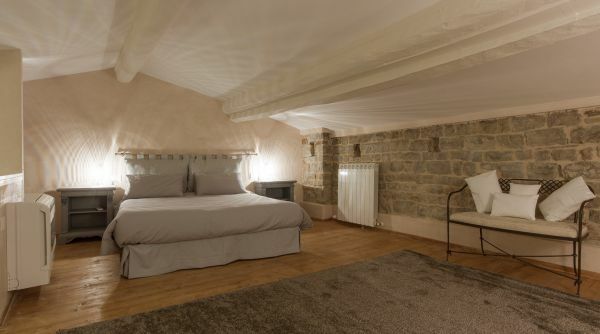 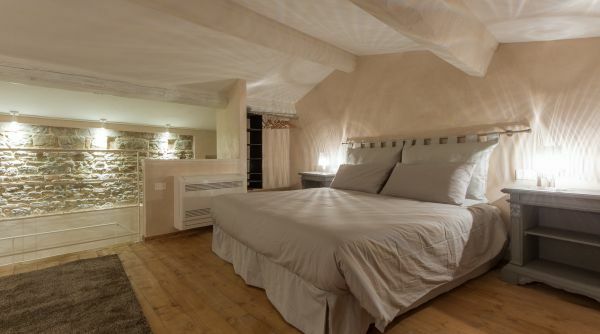 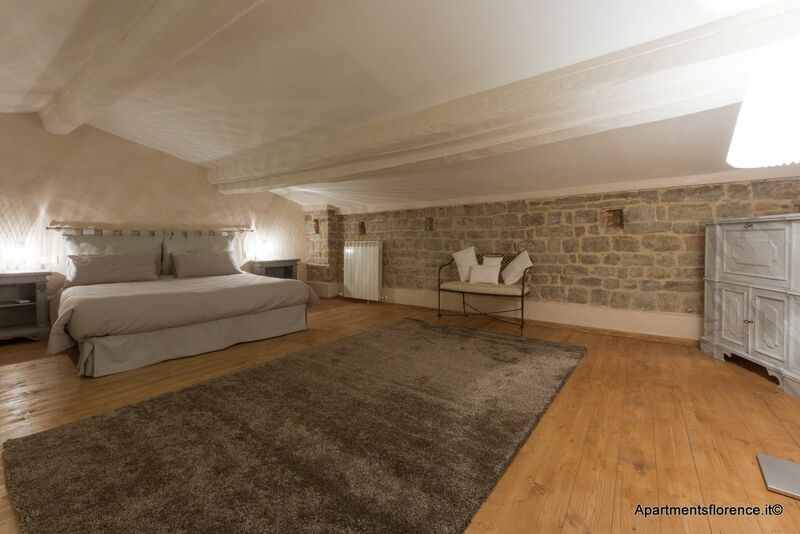 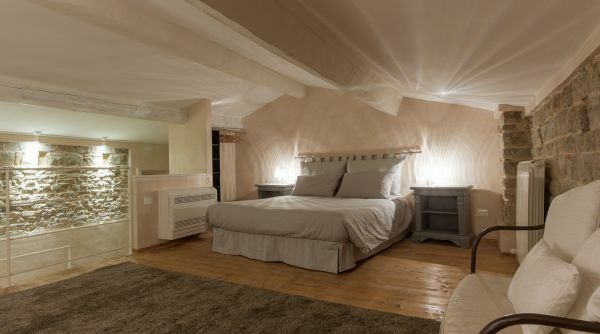 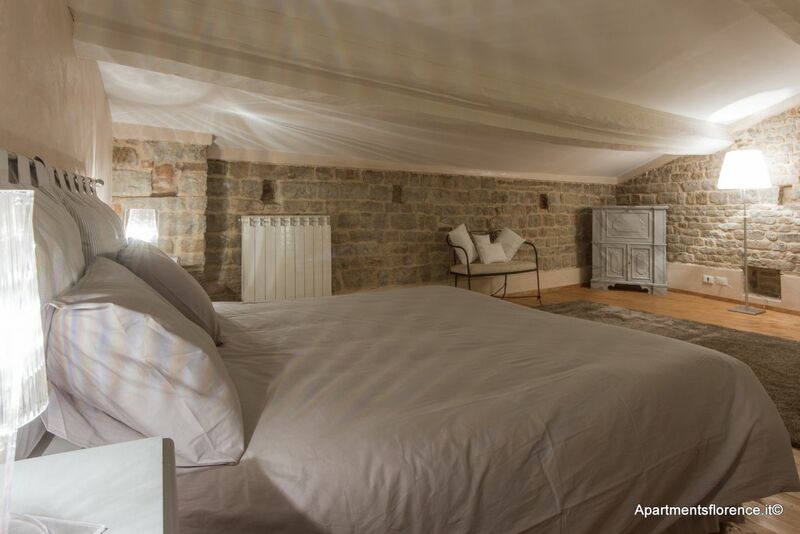 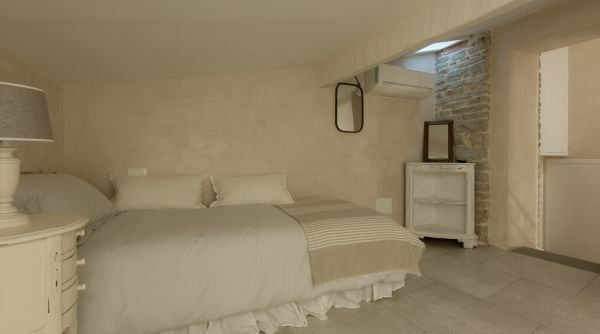 This bedroom is spacious, but with low ceilings and exposed wooden beams. 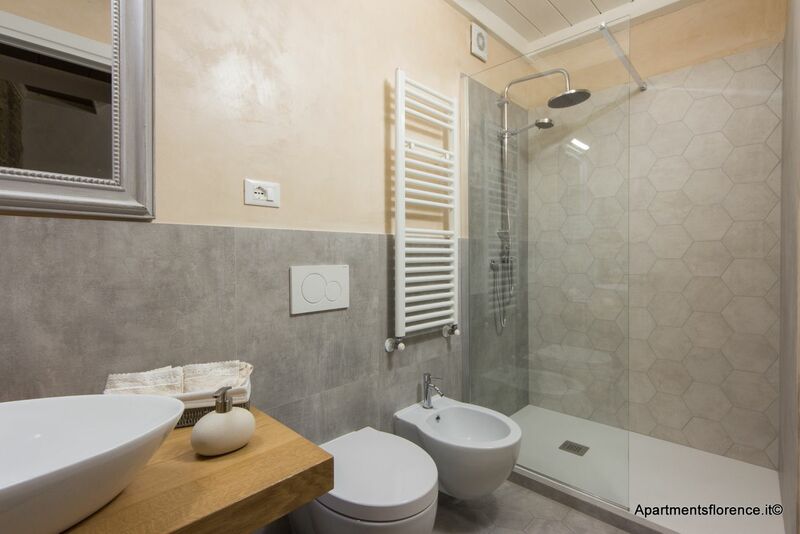 The apartment has 2 completely renovated bathrooms. 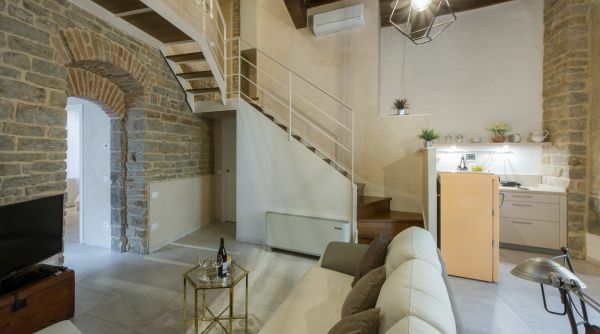 There is air conditioning in the living room and all 3 bedrooms. 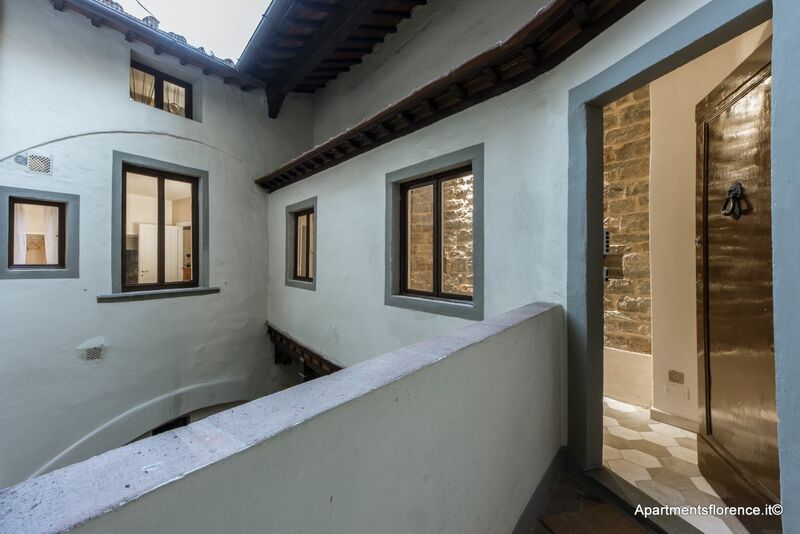 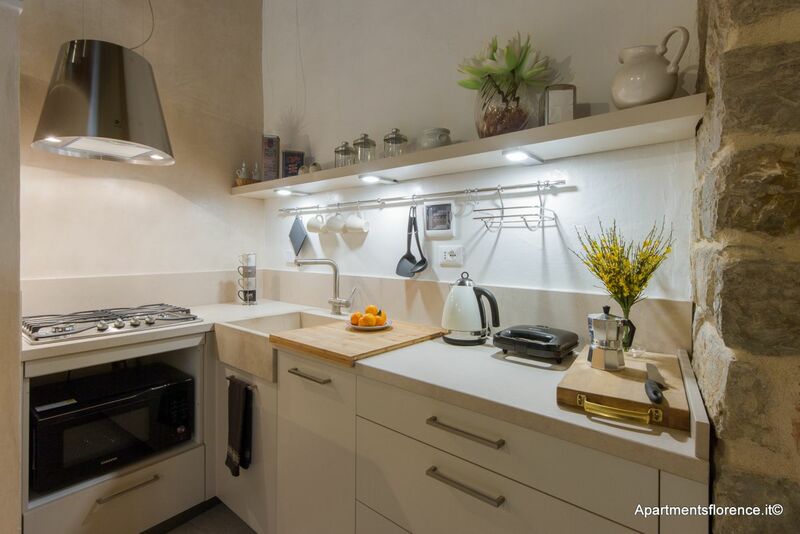 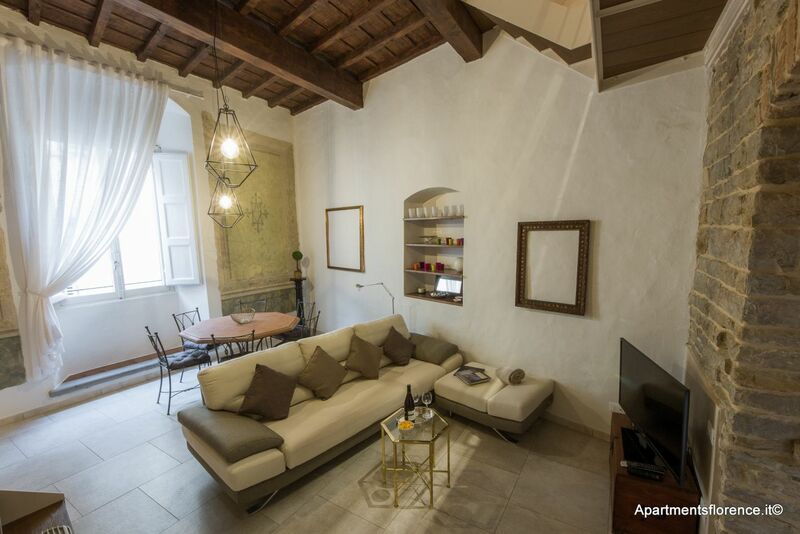 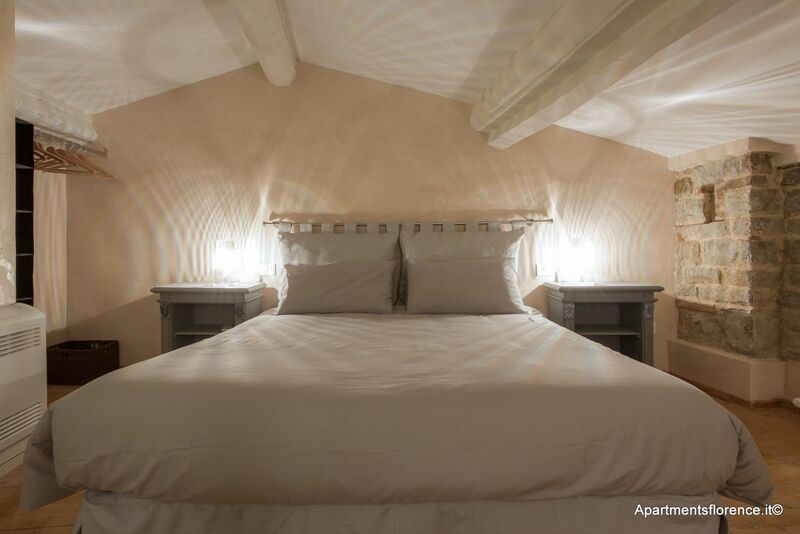 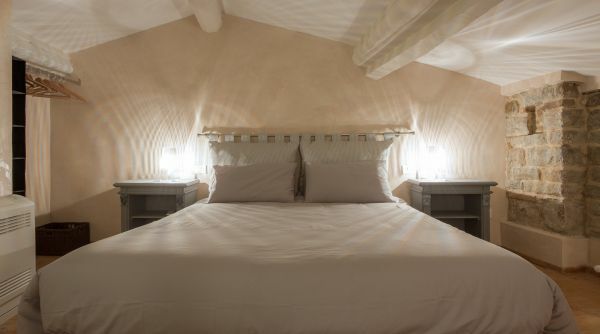 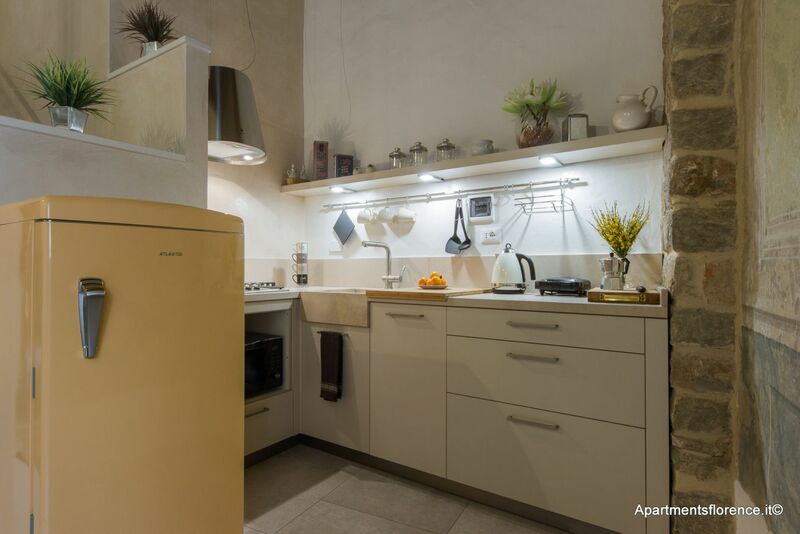 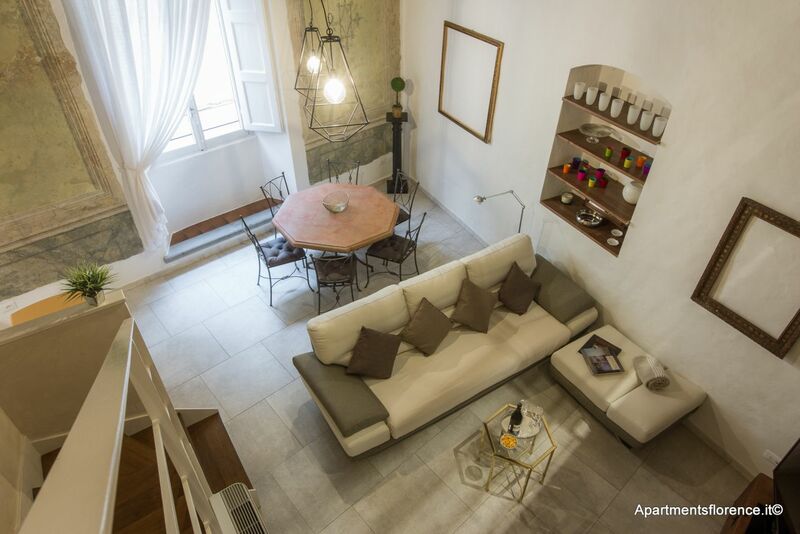 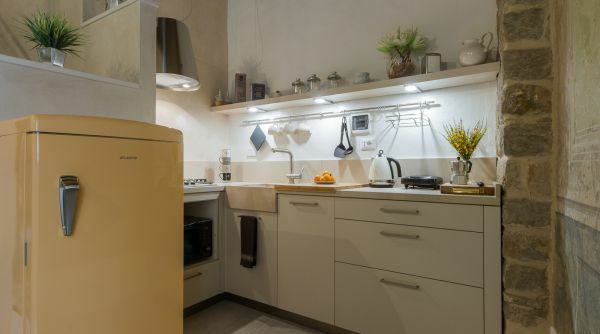 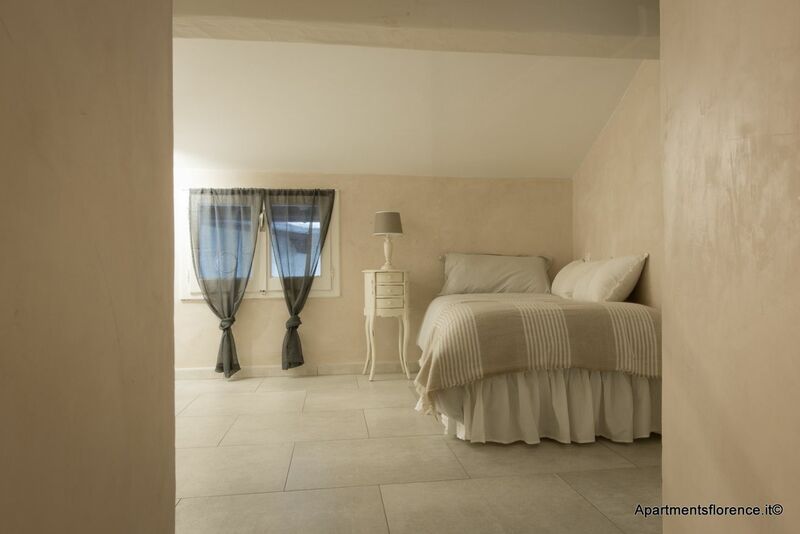 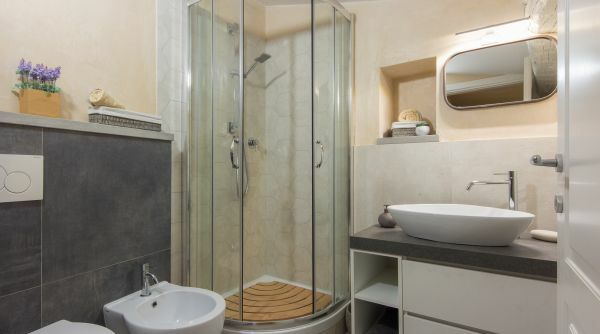 • Amazing location right in the centre of Florence – you couldn’t be more central!